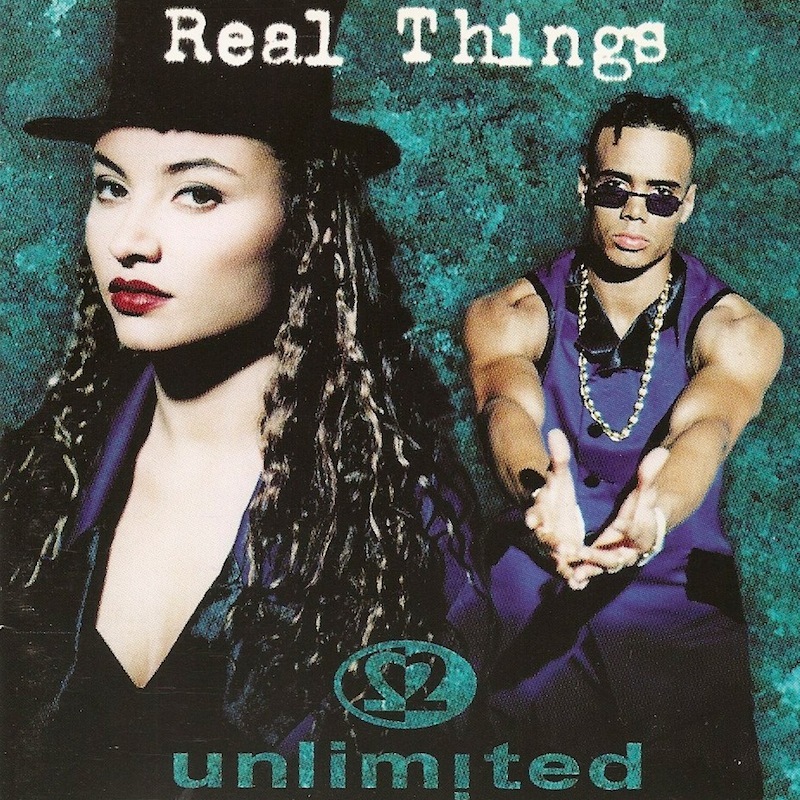 Today’s POP RESCUE is Real Things – the third album from Dutch euro-dance duo 2 Unlimited. Opening with a fast synth intro of Bach‘s Toccata is title track The Real Thing. It’s clear here that 2 Unlimited were packing a punch with this song ‘and we’re not gonna stop until we reach the highest top’, sings Anita. Michael Leahy – one of the songwriters who worked on this album – claims this was because ‘Ray and Anita were being massively copied by the 3rd album’. This was the lead single, and clearly aims to set the tone. Next is Do What I Like gives Anita a perfect platform to show off her vocal power, backed with a throbbing bassline and some sax (?). Again, it sounds like the duo are fighting back at the critics of their previous album. Here I Go is a belter of a track, and it’s unsurprising that it made it as the album’s third single. I remember playing this very loud in my car via a NOW! 30 cd. It’s a great driving song, if not, great driving album. Burning Like Fire feels like a bit of a musical departure, as it’s a bit lighter than the previous 3 tracks, but it is undoubtedly 2 Unlimited as both Anita and Ray perform well here. However, this track feels like it’s the missing link between them and artists like Dr Alban and Culture Beat. Next up is the slightly awkward Info Superhighway – now somewhat cringeworthy and amusing, but back in 1994, this was exciting – the information superhighway (that’s ‘the internet’, kids) was about to consume us all. Facebook and LinkedIn were 10 years away, and yet Anita sings ‘interact with me’ and ‘virtual society’. She knew what she was singing about. For me, this was futuristic as I didn’t have internet access at home until 1997. Sixth track Hypnotised has a catchy intro section which i guess fits the song title, and crops up regularly throughout. This does feel like a slightly softer track with some warm synths and electronic ‘pan pipes’. Ray gets a great rap section amongst Anita’s rich vocals. This is followed by Turning Into Something Wild which is also very catchy, and has some fun lyrics too. ‘Like a comet from space, like a slap in the face. You can feel it coming’. This is one of my favourite tracks on the album, and is a little reminiscent musically at times to their huge hit No Limit. ‘Get on your feet and don’t be lazy’ commands Anita at the opening of next track Escape In Music. This track is nice enough, but doesn’t feel particularly different from the others on this album. Sensuality improves on this though, although it’s probably their most pop track here. At times it feels a bit like a Maxx and Prodigy hybrid. The album’s second single No-One is probably the most mellow of their singles. It’s a great track, opening with Ray’s rapping. It definitely feels like light, summer track, and this was certainly picked up for the video. Track 11 is Face To Face which again relies heavily on Ray’s rapping, and also feels as light as No One. I think I prefer this one over No-One, and it would have made a great single. The synth line reminds me a little of the one in Deuce‘s I Need You. Penultimate track What’s Mine Is Mine sounds almost like another territorial message from Ray and Anita – hands off our music! ‘Why do you want to be like me?’, ‘You know this my property, you’re losing this time’, she sings. Back off rivals! Then the album closes with what is probably my favourite 2 Unlimited track, but probably the least 2 Unlimited track – the brilliant Nothing Like The Rain. This song is a slow, gentle, beautiful ballad, and it really gives Anita the room to show off her vocals. Sadly, this song wasn’t released as a single here in the UK, but did make it in to #6 in their native Netherlands, and saw release in Belgium, Spain, and the USA. As the lyrics state ‘and we won’t give up, and we won’t give in’. This album is a fantastic pocket of early 90s music. The emergence of mainstream dance was well upon the UK chart, and 2 Unlimited were at the forefront of commercially pushing the harder techno side of this. This is a great album to listen to when you’re driving, or looking for something fast and loud to listen to. Where are 2 Unlimited now? 2 Unlimited released a Greatest Hits after this album, but this was pretty much the end of Ray and Anita’s time. Under the same guise, new vocalists joined, but by then their popularity began to fade as music trends shifted back towards guitar-led indie and unashamed manufactured pop groups in the latter part of the 90s. More recently the duo have returned to performing, as the reminiscence of 90s music increases. According to the woman at the counter in the charity store where I bought this, who said that she’d seen them perform a couple of weeks previously: ‘they haven’t aged a day’. 1994 UK CHART POSITION: #1, certified Gold. POP RESCUE COST: £1.00 from an Arthur Rank Hospice Charity store. Posted in 1990s, 2 UnlimitedTagged 1994, album, Here I Go, Michael Leahy, No One, Nothing Like The Rain, Real Things, review, The Real ThingBookmark the permalink.